In Cleveland, perception is reality. If you want a look into the mind of the petulantly angry Cleveland fan, at least as perceived by closer Chris Perez during his outburst to reporters over the weekend, look no further than the small table set up on the outdoor patio of Panini's Bar and Grill on E. 9th St. in downtown Cleveland. 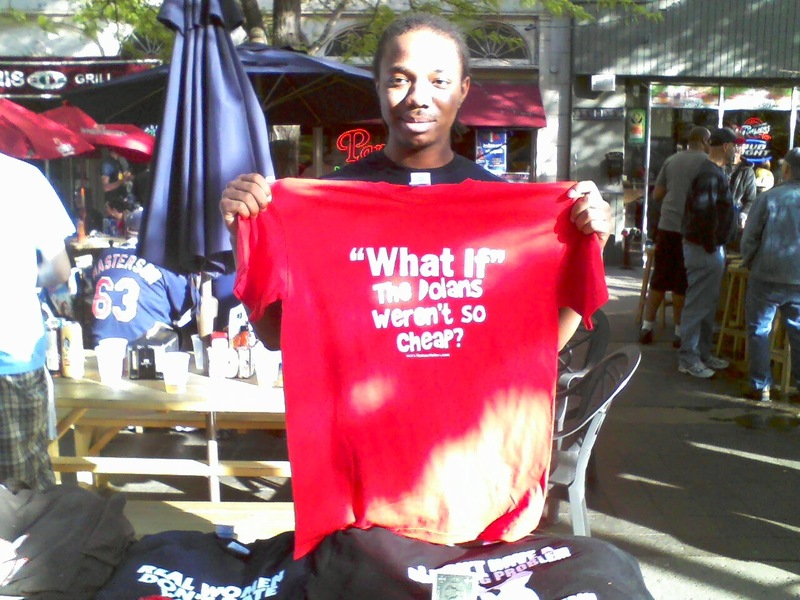 There stands a young capitalist selling homemade t-shirts of the kind offered outside most every stadium in the nation. Invariably cheap-looking cotton shirts embroidered with swears or in the case of Wrigley Field, gay slurs aimed at the top players of rival teams, i.e. "Albert takes it in the Pujols." The table at the Cleveland Panini's contains similar wares, boasting the usual anti-Steelers slogans and the like. One shirt stands out from the lot due to its deep red coloring and mocking sentiment against the very franchise that most people have come downtown to root for. "What If" The Dolans Weren't So Cheap, the shirt reads, a not-so-subtle dig at the Tribe's nostalgia-laced ad campaign of the last two seasons. It's strange seeing this shirt being sold before an Indians game, weirder still witnessing a foursome of giggling twenty-something girls purchase a couple of the tops before heading to Progressive Field for the game. Were these ladies going to wear the ownership-bashing shirts while still cheering for the home team? This discomfiting dichotomy may be symbolic of the current state of Cleveland fandom. Cynicism, anger and rampant negativity have long been components of the fan experience here on the North Coast, but nowadays it seems people are going out of their way to bash their favorite teams. It's especially blatant in a society that is coarsened by the ease and anonymity of social media, allowing fans to reach out and punch save-blowing closers on their Twitter feeds, or leave incoherent rants on a newspaper's website under the drooling guise of "DolenzSuckz69." Perez's pointed comments have been met with both harsh backlash and applauding support from Cleveland faithful, as well as the not-so-faithful fans waiting for the other shoe to drop on the first-place Indians. Perez was correct to bash the fans lustily booing him for letting a couple of guys on base during a game against Seattle last week. There's no percentage in this type of behavior. You may have the right to boo, but I in turn have the right to call you an idiot for booing when the home team's closer hasn't even given up a run yet. That's just stone stupid. But Perez's comments about the attendance, as well as his broaching the taboo subject of free agents avoiding Cleveland, is a much deeper issue than it appears, one that touches on the deep-rooted psychology of a battered fanbase and a city still recovering from its recession struggles. In my 37 years of existence, a good quarter century of them spent avidly rooting for Cleveland's teams, I've never experienced the level of frustration, paranoia and negativity that exists among fans today. Again, that's a product of a shrinking planet where your fellow fan is just a button-push away, but the Tribe's attendance issues are a very real manifestation of the general feeling out there right now. The economy, a shrinking downtown population, distrust in ownership and the fervent wish for a time machine to go back to 1995 all undoubtedly play a role in Progressive Field's tomb-like status lately. However, the half-empty stadium also smacks of an overall fanbase that's come to the end of its already frayed tether. This is a population of fans that's been Murphy's Law'd to a twitching, bloody pulp for a generation, with the last few years being especially miserable. The Tribe sent away two Cy Young-winners in trades that have thus far reaped very little in return; the Browns latest regime has struggled as badly as the (mis)management before it; and finally, the death blow, That Guy in Miami (TGiM) ungraciously departing for South Beach. James leaving may have been the back-breaking straw for many fans, because if Cleveland's not going to win the big prize with that kid, how is any Cleveland team going to win a title, ever in life? Combine those factors with a bad economy and the hopelessness spreads like a disease. Erratic behavior soon follows. Fans see a first-place Indians' team and all they can do is point to the 30-15 squad from the year before that faded once the summer heat hit. It's almost childish how folks have gone out of their way to not support the 2012 Tribe. You almost expect every anti-Dolan tirade to end with the complainer crossing his arms and pouting, "So, there!" In a way, the pessimism is understandable. The current ownership group did themselves no favors not filling a glaring need for a right-handed power bat in the offseason, particularly after signaling a short window of contention by trading the organization's top two pitching prospects for Ubaldo Jiminez. If Perez is right and free agents will only come here for the money, perhaps the Tribe should have taken the risk and added an extra year to the deal they offered Josh Willingham. Instead, they foolishly inked a fragile Grady Sizemore, and are now left scrambling for help among the aging and injured pile of veterans this team always seems to pursue in lieu of actual talent. Fans see that and can't help but be a little cynical. Circumspection is a necessary part of fandom, and there's nothing wrong with not eating every ill-tasting dish that ownership ladles out. Even the Browns are not immune. They may sell out the stadium, but in 2011 were met with swaths of empty orange seats as early as the second home game of the year. See, sports universe, Cleveland is not entirely full of myopic, football-crazed lemmings! What the Indians are experiencing now is way beyond mere cautiousness, however. It's more of an aggressive apathy bordering on spitefulness, an attitude that will take a deep playoff push and an above market free agent to diminish. Until then, the "Dolans are cheap" drum will keep on beating, and the ugly spillover from past disappointments will continue to infect our enjoyment of the teams we once loved.